Grant Robinson was inducted as an Associate Fellow of the Australian Hydrographers Association on Tuesday 13 November 2018. Grant started his career in Forestry with the Forestry Commission of New South Wales from 1971. In 1991 he moved across to the Department of Water Resources as a biometrician — in the Water Quality Unit. He was part of the team that produce the first State of the Rivers Water Quality report for NSW, and later part of a CSIRO led team producing several reports on salinity in the Murray-Darling basin. Grant presented various papers at HYDSYS User Group meetings between 1992-1994 including Implementation for Water Quality and Quality Assurance Models for Water Quality Monitoring. In 1995 at the AHA Conference at Warwick Farm he gave a presentation on Stream Water Quality. In 1998 he worked on a quality system for electrical conductivity monitoring in rivers and streams and following on from this, in 2000 he introduced the Department to ISO9001 for hydrography. Grant presented papers at the 2008, 2010 and 2012 AHA Conferences with titles including Information Quality: More than the Hydstra Quality Code; Hydrometric information; and A national approach to water information standards. From 2009-2010 Grant Project Managed the team development of 7 draft guidelines which were finally published by the Bureau of Meteorology in August 2013 and are now part of the ongoing National Industry Guidelines for Hydrometric Monitoring. Grant became the voluntary AHA Webmaster in 2012 and although he retired in July 2013 he has not stop contributing to the AHA. He joined the AHA Committee as Publicity Officer in 2013, became AHA Secretary in 2015 and has provided volunteer support services to the AHA National Office since 2016. Grant’s ongoing contribution to the professionalism and ongoing success of the AHA is well recognised. 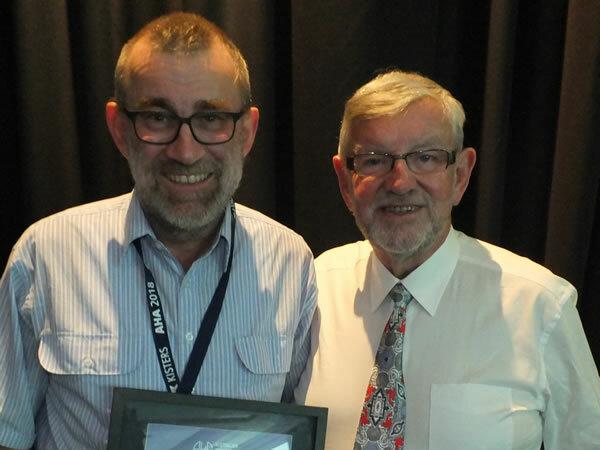 Congratulations Grant for your contribution to the profession and particularly to the AHA and your appointment as “Associate Fellow of the Australian Hydrographers Association”.